Team Learning Provider CEU360.com Opens Booth At 93rd Annual AOTA Conference & Expo In San Diego. CEU360.com, powered by HomeCEUConnection.com, welcomes all occupational therapy superheroes attending the 93rd Annual AOTA Conference & Expo to booth #541 for opportunities to win prizes and forge professional alliances. OTs and OTAs are superheroes, plain and simple. They work hard and they deserve to be recognized and thanked for that. CEU360.com, powered by leading provider of online continuing education for rehab professionals HomeCEUConnection.com, is seeking CE superheroes at the 93rd Annual American Occupational Therapy Association Conference and Expo. Booth staff are on hand now waiting to meet with the occupational therapists and occupational therapist assistants who perform amazing feats in the lives of their clients every day. "OTs and OTAs are superheroes, plain and simple", states owner Anne Osborn. "They may not leap tall buildings in a single bound, but they can help restore a persons ability to live a full and normal life. They work hard and they deserve to be recognized and thanked for that". CEU360.com encourages all attendees at the conference to stop by booth #541 for chances to win prizes, to learn about becoming continuing education presenters and to be celebrated as rehabilitation superheroes. Capes are optional for therapists who choose to attend the conference as their mild mannered alter egos. CEU360.com supports occupational therapy professionals every day by providing the best in online continuing education and powerful therapy team learning solutions. 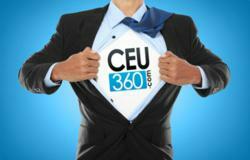 CEU360.com offers a flexible, convenient and affordable alternative to the traditional corporate university. The state of the art delivery method, advanced learning management system and rapid content development means participants see more, learn more, and get more for less per-person than the typical CE reimbursement program. The American Occupational Therapy Association (AOTA) represents the professional interests and concerns of more than 140,000 occupational therapists, assistants, and students nationwide. The Association educates the public and advances the profession of occupational therapy by providing resources, setting standards including accreditations, and serving as an advocate to improve health care. AOTA’s major programs and activities are directed toward promoting the professional development of its members and assuring consumer access to quality services so patients can maximize their individual potential. CEU360.com, the enterprise solution powered by HomeCEUConnection.com provides unparalleled learning solutions for rehabilitation teams. CEU360.com launched to accommodate the pressing need among therapy service providers for a high quality, customizable team learning system. CEU360.com combines HomeCEUConnection.com’s best in class education with a technologically advanced content development system and industry leading learning management system to provide the most advanced team learning solution available. To learn more about CEU360.com visit our website at CEU360.com or call 1-855-2-CEU360.